COME SEW LUTTERLOH WITH ME: Lutterloh Patterns Come Alive! Welcome to your best source for free Lutterloh tips and system information! 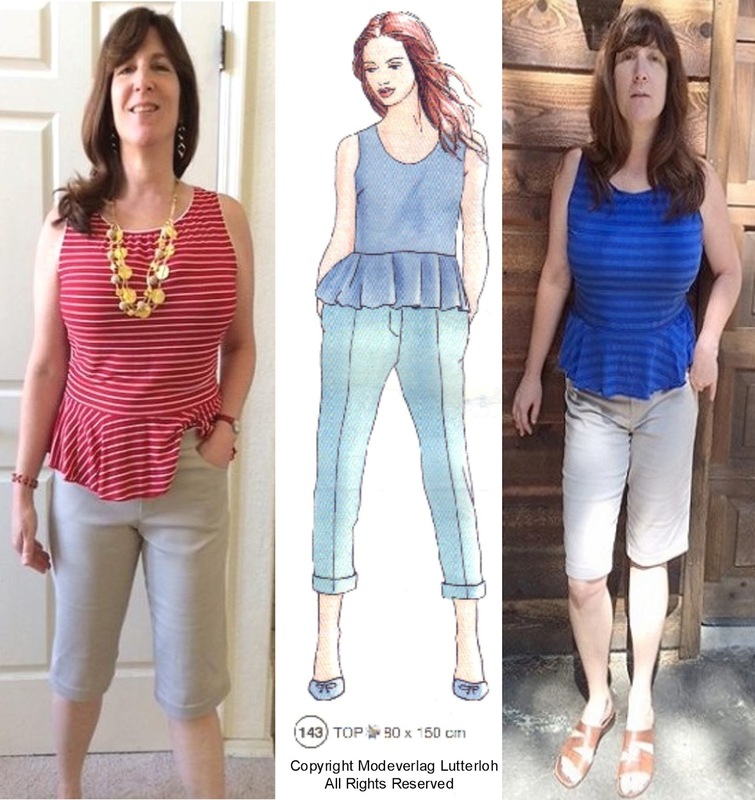 We are a couple of fans of the Lutterloh patterns who love to sew clothes that fit. You too can successfully make a wardrobe from your Lutterloh pattern book. Be sure to check out our side bar for links to Lutterloh dealers and all of our best tricks! This peplum top is designed for knit fabrics. This has turned out to be my favorite top this Summer. The neckline isn't too low and the bust dart provides lots of opportunities for design changes. The straps aren't too narrow but they are cut in just a little at the shoulders so I need a racer back bra under it to avoid straps showing in back. The shorts I'm wearing in the photos are reviewed on my last post here. The peplum top look this year is a little looser and lower than when it was at the height of it's popularity from a couple years back. However, this shouldn't stop you from enjoying this shape if it makes you happy. 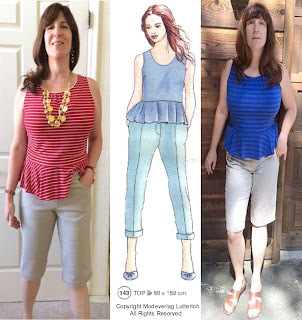 If you check out this link on the Fabric Mart blog you'll see that the most important tip on wearing this trend is to get the proportions right for your figure. There's even a tutorial on how to extend the peplum longer to turn this into a dress here! Because this Lutterloh pattern provides both a bust dart and a fairly shallow peplum it affords lots of opportunities for adjusting it to your figure and the shape of the current trend. Both of the tops in these photos are made from Rayon/Lycra blends. They're both fairly thin and clingy but also have considerable two way stretch and great recovery. The first top I made from this pattern was from a cotton interlock. It was indeed comfortable but because the fabric did not have much stretch or good recovery I ended up with a top that was fairly shapeless falling from my full bust, not a good shape for an hourglass figure. Just keep in mind when choosing your fabric for this top that it needs to stretch over your full bust but also recover well enough to accentuate your waist. It's difficult to see in the photos that the bust dart has been rotated into subtle gathers at the neck. The dart would have interrupted the striped pattern. If using a solid or a very small, busy pattern I wouldn't bother to do this. For a little exercise and some suggestions on how to rotate your bust dart, check out this blog post. If you rotate your bust dart to the bottom of your bodice pattern remember that this will make your bodice wider where it attaches to the peplum. You'll need to slash and spread your peplum pattern an equal amount or you'll end up with gathering where your bodice and peplum meet. Because of the slight cutting in of the armholes I would lay my pattern over another T-shirt pattern with regular shoulders to extend them if I wanted to add sleeves. Otherwise a close fitting sleeve may have to stretch too much in the back causing strange wrinkles. After making this pattern up in a few different knits I'd have to say I definitely prefer the ones that have a little spandex in the blend. If you don't think the peplum look is right for you I would suggest doing a search for some different images. You'll see that you can wear a peplum in lots of varying shapes and you just might find one that you'd like to try. Good choice moving the darts to the neck. In a stretchy knit often you won't even need to worry about a dart anywhere. I love the look of some gathers at the neck. Even some tucks if you aren't fighting stripes looks very nice. #5d Reading the Lutterloh Fashion drawings or getting a great pair of pants.